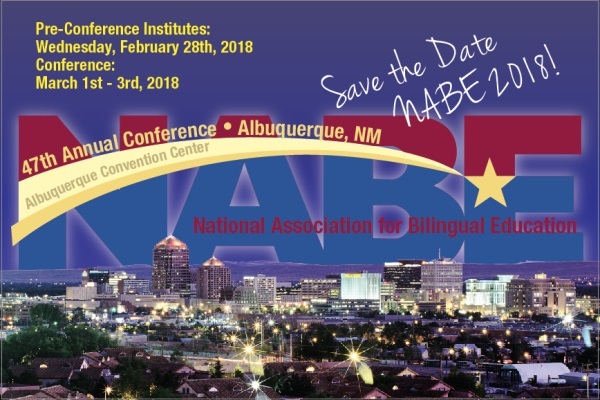 I am humbled and honored that the Board of the National Association for Bilingual Education (NABE) has appointed me president of this prestigious organization for the 2017-2018 term. I follow in the footsteps of NABE leaders who have left a vibrant legacy of working with students, parents, educators, community members, and business partners to make NABE the premier national organization working to increase awareness of and advocate for bilingual education. This responsibility carries the privilege of serving with a stellar team of educators and champions whose dedication and impact have earned allies and appreciation throughout our nation. I recognize and express gratitude to our Executive Board: Dr. María G. Arreguín-Anderson, Vice-President; Dr. Josefina Tinajero, Treasurer; Ms. Francisca Sánchez, Secretary; Ms. Myrna Reyna, Parent Representative; and Regional Executive Board Members, Dr. Leo Gómez, Dr. Rosanna Boyd, Dr. Luis Cruz, Ms. Evelyn DeJesus, and Ms. Isabel Campoy. In addition, the Executive Board could not accomplish the mission of NABE without the leadership of Dr. Santiago Wood, our Executive Director, and our Deputy Executive Director, Ms. Nilda Aguirre and her team.